A lot has changed in the last year... especially when it comes to automation: it has now become the broadly-accepted efficiency tool for cost leverage with operations. Every customer has RPA project managers and automation leads hungry for data, advice, and ideas. Every service provider has RPA embedded into their service delivery models, and every credible advisor has a practice that is working with multiple clients to make this happen. 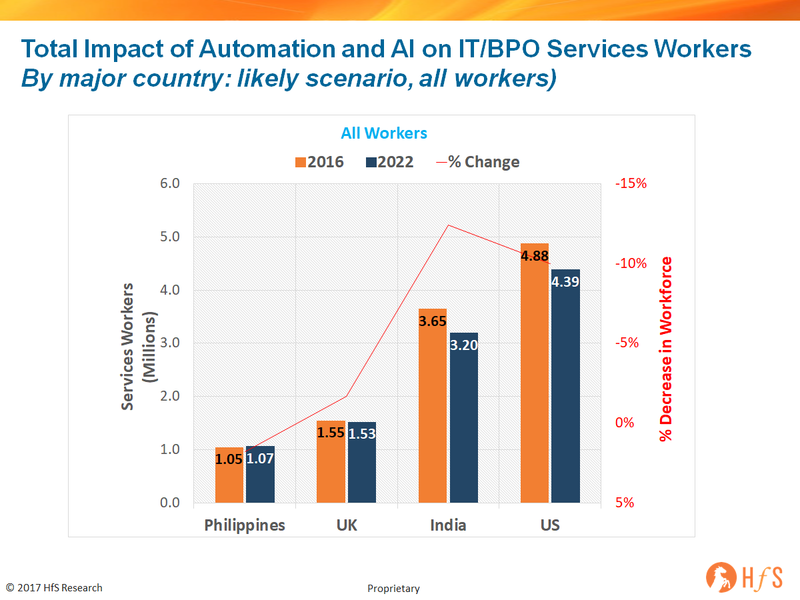 The Armageddon days of talking about robots taking our jobs are over - these are now the reality days where we can see exactly what's going on with automation and AI, and accurately estimate how it's going to impact the services industry in the next few years. There will be impact, but it's manageable provided we focus on new skills and value. 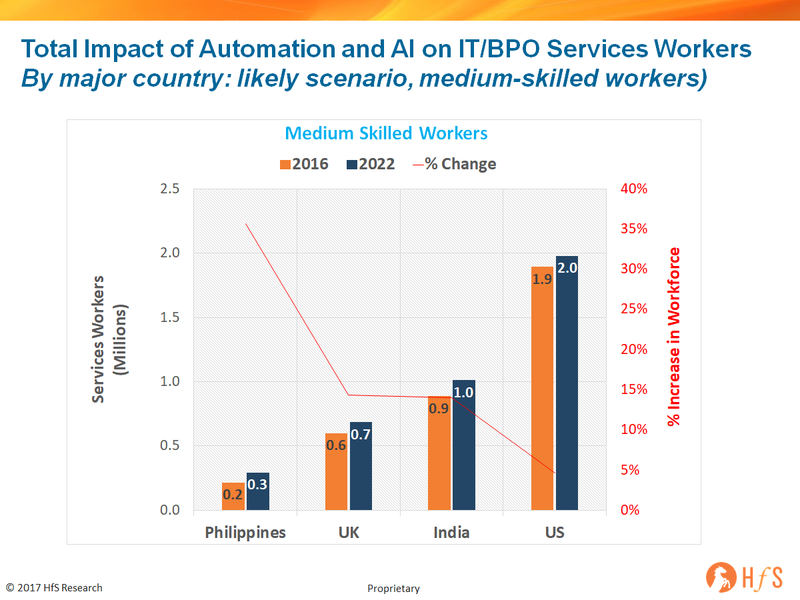 In short, the global IT and BPO services industry employs 16 million workers today. By 2022, our industry will employ 14.8 million - a likely decrease of 7.5%* in total workers (see our research methodology below). 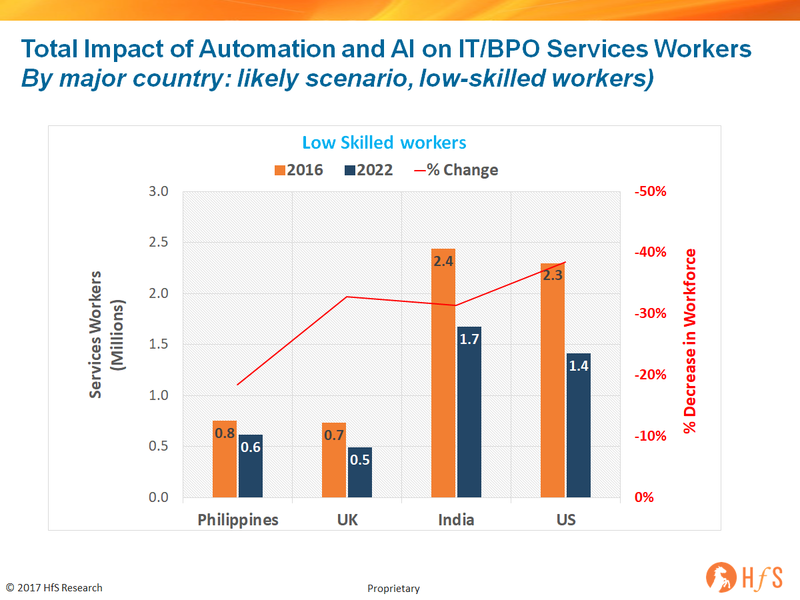 This isn't devastating news - we'll lose this many people through natural attrition, but what this data signifies is this industry is now delivering more for less because of advantages in automation and artificial intelligence. 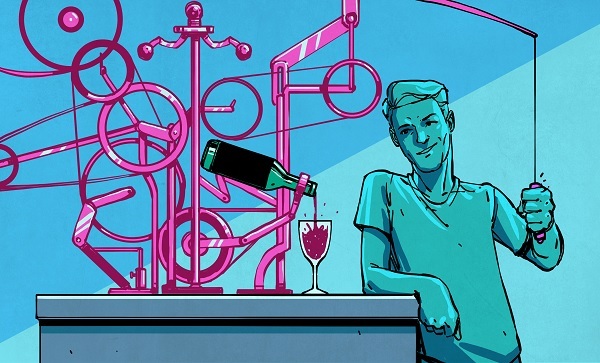 The new data also shows how job roles are evolving from low skilled workers conducting simple entry level, process driven tasks that require little abstract thinking or autonomy, to medium and high skilled workers undertaking more complicated tasks that require experience, expertise, abstract thinking, ability to manage machine-learning tools and autonomy. The big narrative here isn't about what's going away, but more about what is emerging in its place. The next fives years we can manage, it's the five after that when the impact on labor becomes much more challenging. Transaction roles at the bottom of the value chain have been under threat for many years now - with the impact of low cost location delivery and better technology. 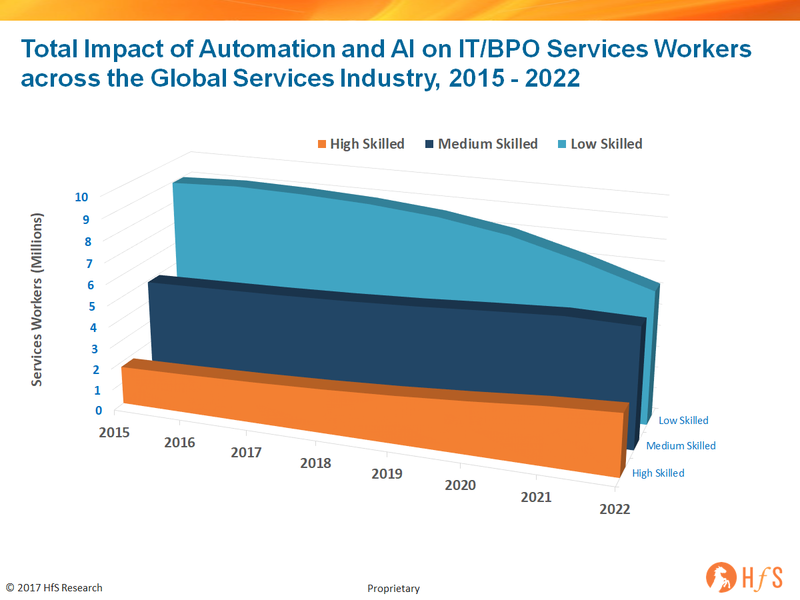 Now the emergence of RPA is eventually going to sound the death knell for most high-throughput, high-intensity jobs, as both service providers and enterprises master the ability to apply these technologies effectively. The good news is this takes time and there is no huge burning platform to do this overnight from most enterprises. Which customers have you delighted recently? What new relationships have you made that add value to our business? What work have you done that excited people inside and outside of the business? How are you helping energize your colleagues and exciting them with new ideas? How have you helped add value to new business wins? How have you contributed to new initiatives that improve productivity and effectiveness? Executive-level interviews with key independent advisors in the automation arena, such as KPMG, EY, Deloitte and Symphony Ventures to understand rate of adoption and other core issues related to automation and AI. Great data. Can you shed light on the impact of AI and not just automation here? Very insightful data. Shows a realistic view of the impact of automation. Also agree with the bigger impact in 2022 - that timeframe feels right. Very interesting data points. 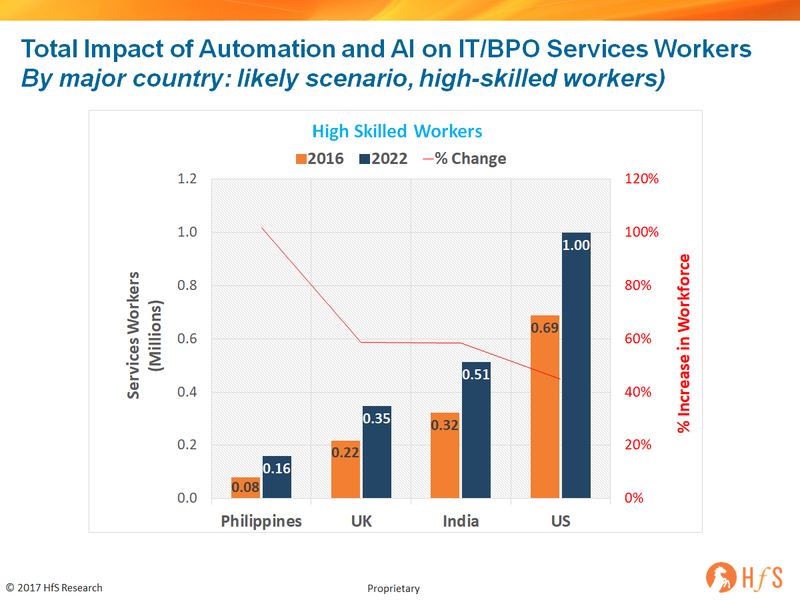 This indicates that the IT/BPO industry can been seen as an engine to create the 'talent of the future', since the industry will have 'embedded education' as it shifts towards machine learning and cognitive solutions. Great insights, Phil. What is your opinion on the growing need for "Content Creation" ? Look at the growing demand for "Content Writers" over the past two to three years on freelance sites & in the growth of the Media industry. Do you think that this large & rapidly expanding opportunity for Content Writers & related Digital Marketing professionals, will not be a part of the Outsourcing industry ? Will the new Media industry ( RR Donnelly , AC Nielsen etc) , successfully eating into the traditional Advertising Agency work for many years, not see competition from the IT&BPO players ? There is a vast range of Content Creation which is being outsourced today. The "technical" content writing is effectively "research" work being outsourced & makes one wonder why the Analysts working in the BPO companies are ignoring it. As your 6 points to ponder over highlight, the Analysts working in an outsourcing company, will have to learn to work closely with their customers & have the ability to sell their analysis/research ( digitally) to their customer's customers. Offshoring & large aggregation of such Content Creation work, will of course be a challenge & it reflects in the small size ( 10 to 20 employee, often lead by an ex-employee ) Content Creation Outsourcing companies which are being set up. Don't you think the IT& BPO industry will also start competing with the New Media providers, over the next few years ? Underlying the A.I. of today ( including Watson) is text ( word sequence) & digital image recognition ( also linked to word association). All of this drives up the need for more content, especially "curated content" i.e. researched & customized content. Surveys/Data & authentication of data is one part of it. The key piece which drives internet content of course is photos/images & that is going to be a key challenge for the IT/BPO players of today, making a foray into the Content creating space. Alliances/Acquisitions of photo-stock portals ( Alamy/ Shutter-Stock etc), may be a solution. Isnt it true that we are at the inception curve of the RPA wave ? Companies are still figuring out the "how" and it is just scratching the surface currently. It is also influenced by the current capability of the product tools; thereby limiting its scope to the simple tasks. This is very akin to the initial phase of the outsourcing journey. Therefore, i concur that the real impact is still a few years out as technology and product tools become more advanced to slowly graduate towards higher skill jobs. GREAT Insight data. Very useful updates and all IT companies to plan for alternative actions and skill upgrade to meet future trends. Creating mid-to-high skilled job opportunities is one thing. Having enough mid to high skilled people to fill them is another. There is significant retraining effort that is required. A few companies have recognized this and have initiatives underway. Many others are yet to recognize the need to do this. Thanks for the analysis. I feel if the market understood this fully, we can anticipate many large transformation deals. As you very well know, automation done in pockets will not reap the desired outcome. It goes hand in hand with the technology & business transformation. It also gives the service provider the ability to transform their workforce and get ready over time , as per specific needs of their customers. Looks like total spend will still increase steadily - As the addition to Mid-High skill workforce (and / or re-skilling) will incur more IT budget than the savings due to diminishing low-skill workforce... overall gain in investment fueling skill-upgrade and overall efficiency and throughput of the industry. 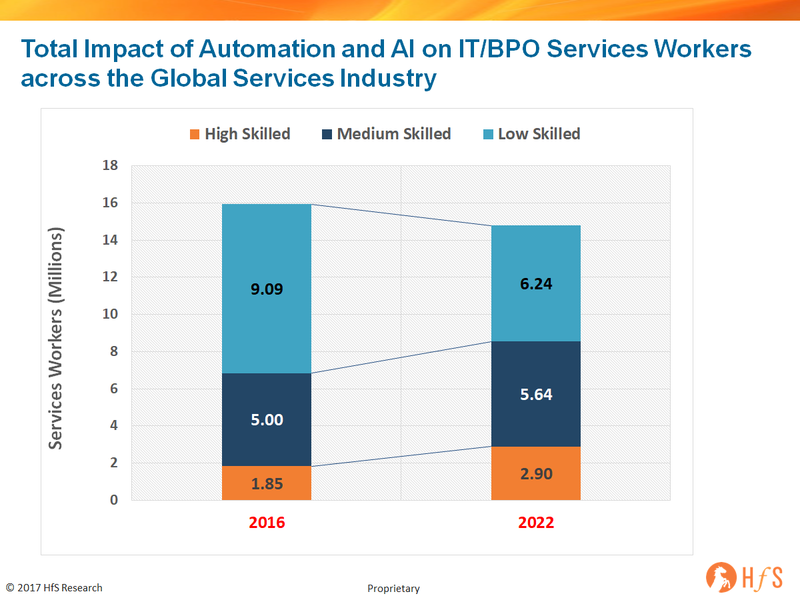 @Partha - the real area to watch here is how the providers build RPA into their delivery models, which is how most customers will ultimately benefit - services that are decreasing in cost, with the same KPIs (hopefully better as processes are more digitized). The more the focus shifts to outcomes, the more the onus will shift to the quality of talent to provide analytics and insights. As discussed, this is an evolution over time, but more like a 3-5 year shift, as opposed to a couple of decades (which was the first phase of moving from onshore to offshore). Nice one Phil. We are seeing that running Ops + RPA itself is creating a new kind of employee who has to work with automation, is comfortable managing BOTs as well as humans. This pivot isn't that difficult and people at the associate/ Team Lead level are picking this up very quickly. On the nascent ML/AI part of the game, things are indeed much more difficult and we see a need to move to ops analyst kind of roles with an enhanced need for reskilling.